Edinburgh Designs have worked with waves for over 30 years producing effects from a simple sine wave, through specialist effects to simulated sea states. With our equipment, there is a certainty that precisely the same wave is produced today as yesterday. This fact enables precision experimentation, ensuring that small changes in the model under test can be properly evaluated. 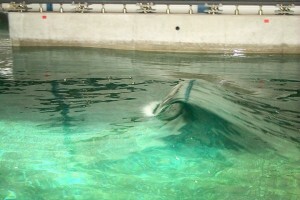 When a wave machine can absorb the energy of any wave coming towards it, the test tank acts more like the real ocean, because waves reflected by the model won’t be returned. 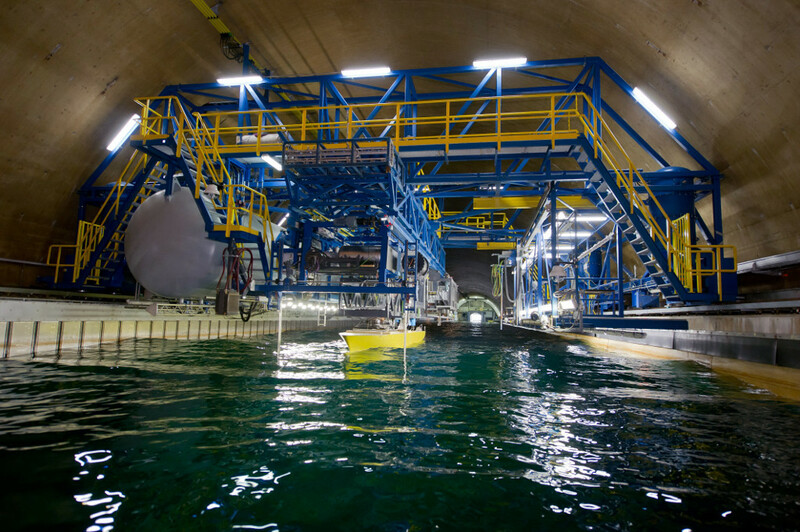 This is especially important for experimental setups like this one, where the reflected waves from the model Oyster wave power machine need to be absorbed. For this reason, all our machines provide active absorption as standard, using a controller with force and position feedback. Our wavemakers use this technology and absorb 97% of the energy of the wave over the significant frequencies. Absorption control brings its own challenges: the need to compensate for the non-linear forces that push the paddle back; limiting the demand to prevent the paddle hitting its end-stops; automating the tank transfer function. Our long exposure to these problems has produced solutions that ensure that users never need to switch this capability off. Force based absorption ensures that the wave environment stays stable, preventing cross wave build-up and other parasitic effects. Our machines also remain accurate over time and continue to work well when the waves are breaking off the front of the paddles. Research at Imperial College London has confirmed that when force based control is correctly set up, it compensates for the Stokes wave components. The video to the right shows a comparison of force and position based wave generation systems. The natural correction of harmonics within the wave is also important when generating random spectral waves. It ensures that there is less interaction between wave components, making the wave more predictable. 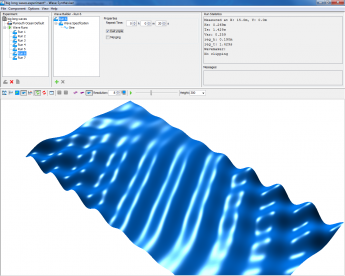 To create finely tuned wave spectra, our software includes the ability to measure and correct for unwanted wave effects. Our experience in tanks around the world enabled us to develop our new Wave Synthesis software. This tool combines the strengths of our language-based approach with a powerful interactive graphical interface. Integrated with it is the Dalrymple method, which enhances the capability of standard rectangular tanks. This also allows animation of the wave in the interface and enables the prediction of the wave amplitude at any point in the tank. Our first fully digital control system was built for the French Navy in 1999. These control algorithms are continuously being improved. We use precision transducers and 64 bit arithmetic to perform the critical filter functions. The wave effect in the photograph, a deep water plunging breaker, shows how simple expressions can be used to create complex singularities. This wave has now become the hallmark of our machines, bringing our company’s academic background into the commercial world of wave tank testing.